The Location Register of the Letters of Samuel Beckett was developed in collaboration with over 25 American literary archives. 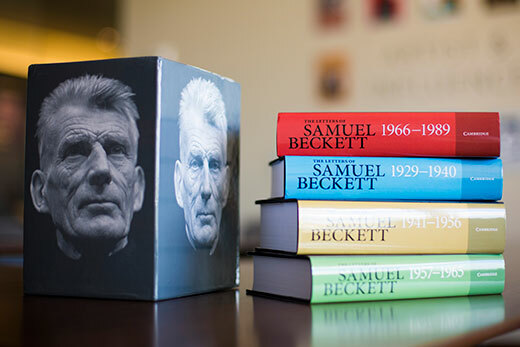 It is a result of The Letters of Samuel Beckett at Emory University, a project established to collect, consult and transcribe all extant letters by Beckett, and to publish the selected edition of “The Letters of Samuel Beckett” in four volumes, completed in 2016. Emory Photo/Video. Martha Dow Fehsenfeld collection of Samuel Beckett letters, 1946-1982. Collection of letters written to Samuel Beckett with responses in his own hand, given to Martha Dow Fehsenfeld in 1987. Samuel Beckett collection, 1955-1996. Collection of handbills, playbills, and programs relating to Samuel Beckett productions in the United Kingdom. John Reilly Samuel Beckett audiovisual material, circa 1965-1993. Audiovisual materials created by John Reilly for his documentaries “Waiting for Beckett” (1994) and “Peephole Art-Beckett for Television” (1994). Dore Ashton and Matti Megged collection, 1942-1994. Collection of letters to author Dore Ashton and Matti Megged including correspondence from Octavio Paz, Samuel Beckett, Italo Calvino, E. E. Cummings and Bernard Malamud. Stuart Rose literary collection, 1821-2012. Collection of manuscript and typescript drafts from well-known English-language authors including Samuel Beckett, Roy Campbell, John Clare, Nancy Cunard, Thomas De Quincey, Seamus Heaney, Ted Hughes, Derek Mahon, Sylvia Plath, Theodore Roethke and W.B. Yeats. Edna O'Brien papers, circa 1939-2000. Literary and personal papers of Irish author Edna O'Brien. Derek Mahon papers, 1948-2014. Papers of poet Derek Mahon, including correspondence, literary manuscripts, collected printed material, photographs, audiovisual material, legal and financial papers, subject files and ephemera. Desmond O'Grady papers, 1953-2007. Personal and literary papers of Irish poet and translator Desmond O'Grady from 1953-2001. Charles Monteith collection, 1948-1994. Collection of materials relating to Faber and Faber editor Charles Monteith including letters written between 1948 and 1994 from many of his literary associates. Raymond Danowski Poetry Library collection, circa 1904-2013. Collection of manuscript material collected as part of the Raymond Danowski Poetry Library including manuscripts, correspondence, printed material, and audiovisual material. Christopher Logue collection, 1945-2001. Personal and literary papers of British author Christopher Logue, including correspondence, literary notebooks, literary manuscripts, and collected printed material. Derek Mahon collection, 1985-1988, 1991, 2000. Small collection of materials relating to Irish poet Derek Mahon that includes correspondence, literary manuscripts, and some printed material. Peter Fallon - Gallery Press collection, circa 1967-1998. Personal and literary papers of Irish poet and publisher Peter Fallon, as well as the archives of the Gallery Press.